Thanyapura’s Steve Wallace (left) stands with Laurie Griffin and Gogo. Success FC Academy’s older players. The club was unable to pay outstanding debts totalling B83 million after being sued by three former international players after their contracts were terminated by the club for alleged misbehaviour. Following the termination of the club, Chonburi FC took over the island’s football representation by forming and managing Banbueng Phuket City Football Club, playing out of none other than Banbueng Municipality Stadium in Chonburi, which happens to be 900km away. Naturally this lost a fair few supporters who were already hanging on by a thread after years of uncertainty, leaving the Island’s football scene in the shadow of its former status. One man who remains optimistic about Phuket’s footballing future is Jarupong Sangpong, or Gogo as he is known on the pitch. Gogo played professionally for Bangkok based clubs Army United FC and Police Tero FC (formally known as BEC Tero FC) who currently play in Thai League 2 having been relegated from the top flight last season. After his retirement from professional football, Gogo became an assistant coach at Army United before moving to Phuket where his vision for the island’s youth took form. “When I came to Phuket I saw an opportunity to help build and nurture the young talent here,” Gogo told The Phuket News. The former pro spoke of how football can be a gateway to great career opportunities around the country – something he is passionate about helping to create. Gogo is head coach of Success FC Academy – a youth football academy where he provides structured training for local youth after school at the Prince Of Songkla University, Phuket Campus football grounds. Proud parents watch in the stands as their children, proudly sporting Success FC jerseys, strive to be the next Ronaldo. 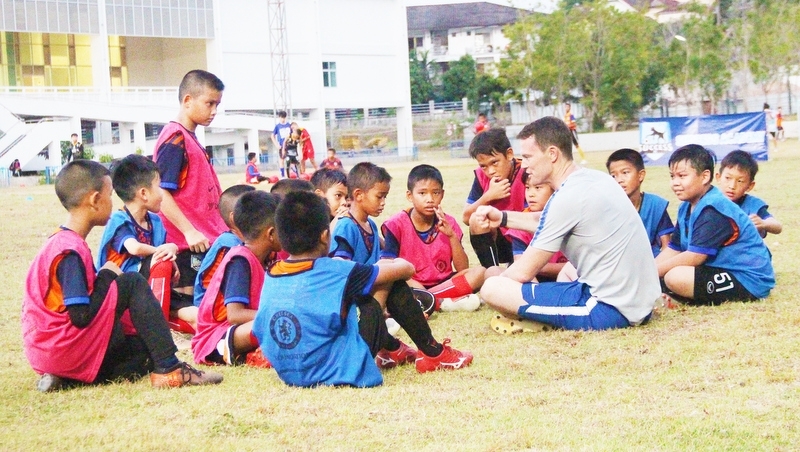 Thanyapura Sports Resort in Thalang is aiming to do more for youth football in Phuket, seeking to work with all clubs to help support the game on the island with the help of a new appointment in Steve Wallace, the company’s Football Head Coach & Business Development Manager. Wallace, who played for Premier League side Newcastle United as a school boy and then coached with the club’s youth programmes, moved to Phuket in 2018 after spending 15 years in the states working as a football coach and club consultant, including development work for MLS (Major League Soccer) – the country’s top professional football league. He was part of a group of coaches tasked with promoting the league through community coaching to raise the profile of the sport and promote the new league, which struggled to gain popularity when it began in 1996 in a country dominated by baseball, American football and basketball. However, the league has grown significantly over the years with total attendance at games in 2018 reaching 8,552,503 compared with 2,215,019 in 2002. 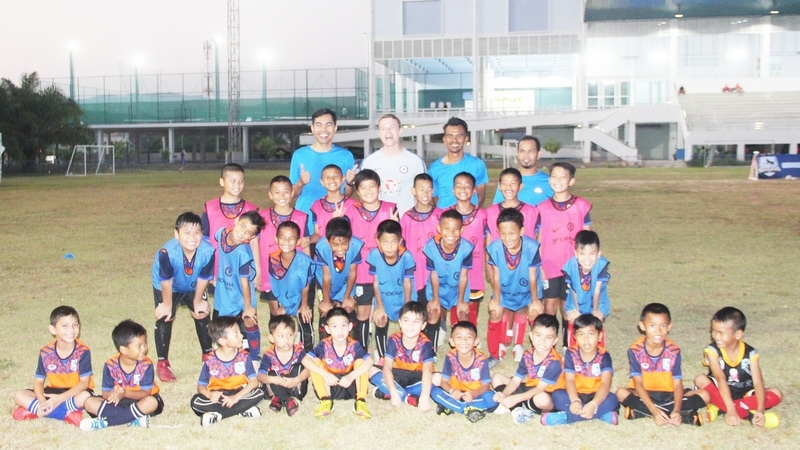 Now one of Wallace’s primary goals is to promote and grow football in Phuket. “When I first arrived in Phuket, I used to go for runs around the university grounds which is where I discovered the Success FC Academy,” Wallace told The Phuket News. Wallace volunteered as a coach to help the kids in the academy while starting to study Thai. It wasn’t long before Wallace took up his new role at Thanyapura which came at a fitting time to bring together their shared vision of nurturing the island’s footballing youth. “There has been no youth league on the island for some time, which is something we want to help facilitate,” Wallace said. “Football has always been a sport that brings communities together and we want to use football to try to benefit local communities. This is why with the help of Thanyapura we could call on Chelsea FC to offer their expertise in having this event with Success FC this evening,” he explained. Wallace emphasised that of all the big clubs he has worked with, Chelsea have stood out as the most professional and community-focused. 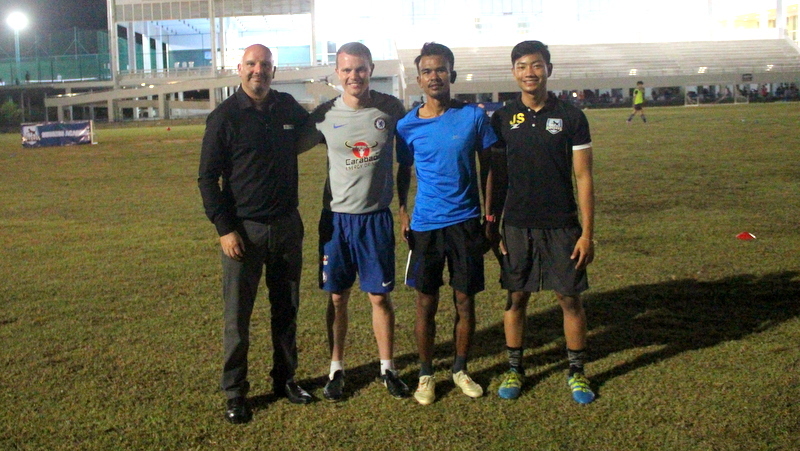 Thanyapura enlisted the proficiency of Chelsea’s senior international development officer, Laurie Griffin, to coach youth players in Phuket at an evening session last Tuesday (Feb 5) with Success FC Academy at the Prince Of Songkla University, Phuket Campus football grounds. “It is a great privilege to have such an outstanding coach training our local players, passing on great knowledge and stirring up new excitement for the sport,” Wallace said. Laurie Griffin, who has worked at Chelsea for the past four years, having worked for Manchester United before that, works specifically in developing youth players. He travels all over the world coaching young players and coaches, with the sole aim of helping to develop football in places where the youth can benefit the most from it. Griffin went on to explain that the programme – which started with two members of staff and is now in its 45th country – shares the same vision as Thanyapura in giving back to local communities, with coaching education workshops given to help develop quality coaches who would be able to sustain and drive the vision forward. A Chelsea International Player Development Project (hosted by Thanyapura Sports Resort) will take place from April 15 to 18. 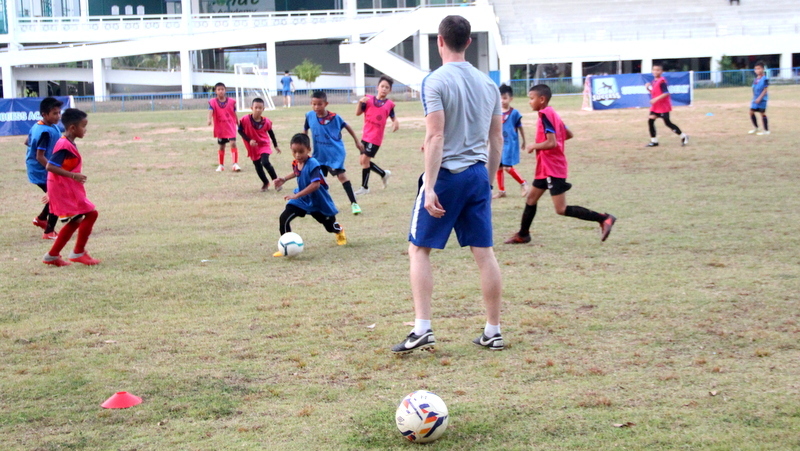 Young boy and girls will have the opportunity to train with professional youth coaches from Chelsea FC on their first ever visit to Phuket. Pre-registration is available now with minimum three nights hotel stay at Thanyapura. To register, call and ask for the Thanyapura sports booking department on 076-336-000. Thanyapura will also hold a Chelsea event all day on Saturday April 20 for local schoolchildren. Details of the event will be published on their website.